Brazilian foreign minister Celso Amorim is having the time of his life this week. After a quarter century of grandiose but empty declarations of developing country unity on trade issues, Hong Kong has finally sealed the deal. 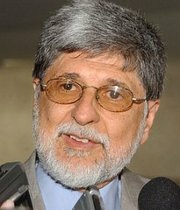 Amorim is acting as the de facto leader of the Brazil-India alliance, which is at the heart of the G20 group of developing nations, which has roped in the G33 and G90 groups of developing nations and includes 110 countries and 80% of the world population. India and Brazil have been deliberate about working out common negotiating positions with the other developing country groups, and they seem to have overcome the poorest countries’ initial reticence in this regard. Again, the outcome of this will not be a development-friendly agreement, at least not immediately. There’s no chance for “full negotiating modalities” to be agreed here and there may not even be any agreement at all. The difference this time around is that the EU is going to take the blame, not the developing countries. It’s never happened before, and it sets up a very different atmosphere for the rest of the Doha Round. The developing countries will keep the initiative while Europe take a defensive position, making increasingly unconvincing excuses for blocking progress. Given that that the ministerial was never really likely to succeed in producing a complete outline agreement, this is the best outcome the developing world could have hoped for. And Amorim deserves a lot of the credit for that. Next articleVenezuela electoral results watch, Day 12 or how I stopped worrying and learned to love the CNE.